This sweet Easter design will bring a touch of fun to your holiday celebrations. 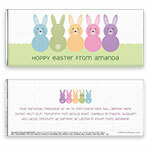 Design: Colourful Easter bunnies in a row. Personalization: Front and back greetings.